Kim Jong-un Supreme Leader of The Democratic People’s Republic of Korea. Kim Jong-un (Korean pronunciation: [ɡ̊imd͜zɔŋɯn]; born 8 January 1983; also romanized as Kim Jong-eun, Kim Jong Un or Kim Jung-eun) is the supreme leader of the Democratic People’s Republic of Korea (North Korea). He is the son of Kim Jong-il (1941–2011) and the grandson of Kim Il-sung (1912–1994). He has held the titles of the First Secretary of the Workers’ Party of Korea, the Chairman of the Central Military Commission, Chairman of the National Defence Commission, the Supreme Commander of the Korean People’s Army, and presidium member of the Politburo of the Workers’ Party of Korea. He was officially declared the supreme leader following the state funeral of his father on 28 December 2011. He is the third and youngest son of Kim Jong-il and his consort Ko Yong-hui. From late 2010, Kim Jong-un was viewed as heir apparent to the leadership of the nation, and following his father’s death, he was announced as the “Great Successor” by North Korean state television. At Kim Jong-il’s memorial service, North Korean Chairman of the Supreme People’s Assembly Kim Yong-nam declared that “Respected Comrade Kim Jong-un is our party, military and country’s supreme leader who inherits great comrade Kim Jong-il’s ideology, leadership, character, virtues, grit and courage”. On 30 December 2011, the Politburo of the Workers’ Party of Korea formally appointed Kim as the Supreme Commander of the Korean People’s Army. In April 2012, the 4th Party Conference elected him to the newly created post of First Secretary of the Workers’ Party of Korea. He was promoted to the rank of marshal of the DPRK in the Korean People’s Army on 18 July 2012, consolidating his position as the supreme commander of the armed forces and is often referred to as Marshal Kim Jong-un or “the Marshal” by state media. He obtained two degrees, one in physics at Kim Il-sung University and another as an Army officer at the Kim Il-sung Military University. On 9 March 2014 Kim Jong-un was elected unopposed to the Supreme People’s Assembly. At 32 years of age, he is the first North Korean leader born after the country’s founding and the world’s youngest head of state. Kim was named the world’s 46th most powerful person by the Forbes list of The World’s Most Powerful People in 2013, the third highest among Koreans after Ban Ki-moon and Lee Kun-hee. Kim was formerly known as Kim Jong-woon or Kim Jung-woon. His name was first reported as 김정운 (Hanja: 金正雲; lit. righteous cloud), possibly as a result of an error in transliteration; the Japanese language does not distinguish between 운 (/un/) and 은 (/ɯn/). The initial source of his name was Kim Jong-il’s former personal chef, known by the pen name Kenji Fujimoto, who was among the few who had access to information about Kim’s household from inside the government. Chinese media had named him as 김정은 (Hanja: 金正恩; lit. righteous grace). No official comprehensive biography on Kim Jong-un has yet been released. Therefore, the only known information on his early life comes from defectors and people who have claimed to witness him abroad, such as during his school attendance in Switzerland. Some of the information has been conflicting and contradictory, perhaps conflating him with his brother Kim Jong-chul, who was also attending school in Switzerland around the same period. Nevertheless, there has been some consensus on information about his early life. North Korean authorities have stated that his birthdate is 8 January 1982, but South Korean intelligence officials believe the actual date is a year later. Dennis Rodman said that the birthdate is 8 January 1983 after meeting Kim in September 2013. Kim Jong-Un was the second of three children Ko Yong-hui bore to Kim Jong-il; his elder brother Kim Jong-chul was born in 1981, while his younger sister, Kim Yo-jong, is believed to have been born in 1987. According to reports first published in Japanese newspapers, he went to school in Switzerland near Bern. First reports claimed he attended the private English-language International School in Gümligen near Bern under the name “Chol-pak” or “Pak-chol” from 1993 until 1998. He was described as shy, a good student who got along well with his classmates and was a basketball fan. He was chaperoned by an older student, who was thought to be his bodyguard. Later, it was reported that Kim Jong-un attended the Liebefeld Steinhölzli school in Köniz near Bern under the name “Pak-un” or “Un-pak” from 1998 until 2000 as the son of an employee of the Embassy of North Korea. Authorities of Köniz confirmed that a student from North Korea, registered as the son of a member of the Embassy, attended the school from August 1998 until the autumn of 2000, but were unable to give details about his identity. Pak-un first attended a special class for foreign-language children and later attended the regular classes of the 6th, 7th, 8th, and part of the final 9th year, leaving the school abruptly in the autumn of 2000. He was described as a well-integrated and ambitious student who liked to play basketball. However, his grades and attendance rating are reported to have been poor. The ambassador of North Korea in Switzerland, Ri Tcheul, had a close relationship with him and acted as a mentor. One of Pak-un’s classmates told reporters that he had told him that he was the son of the leader of North Korea. According to some reports, Jong-un was described by classmates as a shy child who was awkward with girls and indifferent to political issues but who distinguished himself in sports, and had a fascination with the American National Basketball Association and Michael Jordan. One friend claimed that he had been shown pictures of Pak-un with Kobe Bryant and Toni Kukoč. It is believed that the student at the Gümligen International School was not Kim Jong-un but his elder brother Kim Jong-chol. It is not known whether the student known as Pak-un in Liebefeld Steinhölzli lived in Switzerland prior to 1998. All the children of Kim Jong-il are said to have lived in Switzerland, as well as the mother of the two youngest sons, who lived in Geneva for some time. The Kim clan is also said to organize family meetings in Switzerland at Lake Geneva and Interlaken. For many years, only one confirmed photograph of him was known outside North Korea, apparently taken in the mid-1990s, when he was eleven. Occasional other supposed images of him surfaced but were often disputed. It was only in June 2010, shortly before he was given official posts and publicly introduced to the North Korean people, that more pictures were released of Kim, taken when he was attending school in Switzerland. The first official image of him as an adult was a group photograph released on 30 September 2010, at the end of the party conference that effectively anointed him, in which he is seated in the front row, two places from his father. This was followed by newsreel footage of him attending the conference. In 2013, Kim Jong-un was awarded an honorary doctorate in Economics by HELP University, a private Malaysian university. His eldest half-brother, Kim Jong-nam, had been the favorite to succeed, but reportedly fell out of favor after 2001, when he was caught attempting to enter Japan on a fake passport to visit Tokyo Disneyland. Kim Jong-il’s former personal chef, Kenji Fujimoto, revealed details regarding Kim Jong-un, with whom he had a good relationship, stating that he was favored to be his father’s successor. Fujimoto also claimed that Jong-un was favored by his father over his elder brother, Kim Jong-chul, reasoning that Jong-chul is too feminine in character, while Jong-un is “exactly like his father”. Furthermore, Fujimoto stated that “If power is to be handed over then Jong-un is the best for it. He has superb physical gifts, is a big drinker and never admits defeat.” Also, according to Fujimoto, Jong-un smokes Yves Saint Laurent cigarettes, loves Johnnie Walker whisky and has a Mercedes-Benz 600 Sedan. When Jong-un was 18, Fujimoto described an episode where Jong-un once questioned his lavish lifestyle and asked, “We are here, playing basketball, riding horses, riding Jet Skis, having fun together. But what of the lives of the average people?” On 15 January 2009 the South Korean news agency Yonhap reported that Kim Jong-il had appointed Kim Jong-un to be his successor. On 8 March 2009, the BBC reported rumors that Kim Jong-un was on the ballot for elections to the Supreme People’s Assembly, the rubber stamp parliament of North Korea. Subsequent reports indicate that his name did not appear on the list of lawmakers, but he was later elevated to a mid-level position in the National Defense Commission, which is a branch of the North Korean military. Reports have also suggested that he is a diabetic and suffers from hypertension. From 2009, it was understood by foreign diplomatic services that Kim was to succeed his father Kim Jong-il as the head of the Korean Workers’ Party and de facto leader of North Korea. He has been named “Yŏngmyŏng-han Tongji” (영명한 동지), which loosely translates to “Brilliant Comrade”. His father had also asked embassy staff abroad to pledge loyalty to his son. There have also been reports that citizens in North Korea were encouraged to sing a newly composed “song of praise” to Kim Jong-un, in a similar fashion to that of praise songs relating to Kim Jong-il and Kim Il-sung. Later, in June, Kim was reported to have visited China secretly to “present himself” to the Chinese leadership, who later warned against North Korea conducting another nuclear test. The Chinese Foreign Ministry has strongly denied that this visit occurred. North Korea was later reported to have backed the succession plan, after Kim Jong-il suspended a propaganda campaign to promote his youngest son. His birthday has since become a national holiday, celebrated on 8 January, according to a report by a South Korean website. He was expected to be named on 28 September 2010 as successor to his father as leader of North Korea. Former U.S. president Jimmy Carter visited China in early September 2010, and discussed the issue of the North Korean leadership succession with Chinese Premier Wen Jiabao. According to Carter, Kim Jong-il had said to Wen that Kim Jong-un’s prospective promotion to paramount leader of North Korea was “a false rumor from the West”. Kim Jong-un was made a daejang, the equivalent of general in the United States, on 27 September 2010, a day ahead of a rare Workers’ Party of Korea conference in Pyongyang, the first time North Korean media had mentioned him by name and despite his having no previous military experience. Despite the promotion, no further details, including verifiable portraits of Kim, were released. On 28 September 2010, he was named vice chairman of the Central Military Commission and appointed to the Central Committee of the Workers’ Party, in an apparent nod to become the successor to Kim Jong-il. On 10 October 2010, alongside his father, Kim Jong-un attended the ruling Workers’ Party’s 65th anniversary celebration. This was seen as fully confirming his position as the next leader of the Workers’ Party. Unprecedented international press access was granted to the event, further indicating the importance of Kim Jong-un’s presence. In January 2011, the regime began purging around 200 protégés of both Jong-un’s uncle-in-law Jang Sung-taek and O Kuk-ryol, the vice chairman of the National Defence Commission of North Korea, by either detention or execution to further prevent either man from rivaling Jong-un. In the following months, Kim Jong-un was given more and more prominence as he accompanied Kim Jong-il during several “guidance tours” and received gifts from foreign delegations and personages, an honor traditionally awarded only to the living supreme leader. On 17 December 2011, Kim Jong-il died. Despite the elder Kim’s plans, it was not immediately clear after his death whether Jong-un would in fact take full power, and what his exact role in a new government would be. Some analysts had predicted that when Kim Jong-il died, Jang Sung-taek would act as regent, as Jong-un was too inexperienced to immediately lead the country. On 25 December 2011, North Korean television showed Jang Sung-taek in the uniform of a general in a sign of his growing sway after the death of Kim Jong-il. A Seoul official familiar with North Korea affairs said it was the first time Jang has been shown on state television in a military uniform. His appearance suggested that Jang had secured a key role in the North’s powerful military, which pledged its allegiance to Kim Jong-un. He was publicly declared Supreme Commander of the Korean People’s Army on 24 December 2011 and formally appointed to the position on 30 December when the Political Bureau of the Central Committee of the Workers’ Party “courteously proclaimed that the dear respected Kim Jong Un, vice-chairman of the Central Military Commission of the WPK, assumed the supreme commandership of the Korean People’s Army”. On 26 December 2011, the leading North Korean newspaper Rodong Sinmun announced that Kim Jong-un had been acting as chairman of the Central Military Commission, and supreme leader of the country, following his father’s demise. On 9 January 2012, a large rally was held by armed forces in front of Kumsusan Memorial Palace to honor Kim Jong-un and demonstrate loyalty. On 27 March 2012, Kim was elected to the Fourth Conference of the Workers’ Party of Korea, that elected him first secretary, a newly made position, on 11 April. This position replaced the post of general secretary, which was awarded “eternally” to Kim Jong-il. At the conference, Kim Jong-un also took his father’s seats as Politburo Presidium member and Chairman of the Central Military Commission. In a speech made prior to the Conference, Kim Jong-un declared that “Imbuing the whole society with Kimilsungism-Kimjongilism is the highest programme of our Party”. On 13 April 2012, the 5th Session of the 12th Supreme People’s Assembly appointed Kim Jong-un Chairman of the National Defence Commission. On 15 April 2012, during a military parade to commemorate Kim Il-sung’s centenary, Kim Jong-un made his first public speech. That speech became the basis of “Onwards Toward the Final Victory“, a repeatedly aired propaganda hymn dedicated to him. In July 2012, Kim Jong-un was promoted to wonsu, the highest active rank in the military. The decision was jointly issued on by the Central Committee and the Central Military Commission of the Workers’ Party of Korea, the National Defence Commission, and the Presidium of the Supreme People’s Assembly, the Korean Central News Agency subsequently announced. By this promotion, he is one of only two wonsu holders now alive in North Korea. The other is Lee Ul-sol, who received the rank in 1995. The only higher rank is Dae Wonsu (roughly translated as Grand Marshal or Generalissimo) which was held by Kim’s grandfather, Kim Il-sung, and which was awarded posthumously to his father, Kim Jong-il, in February 2012. 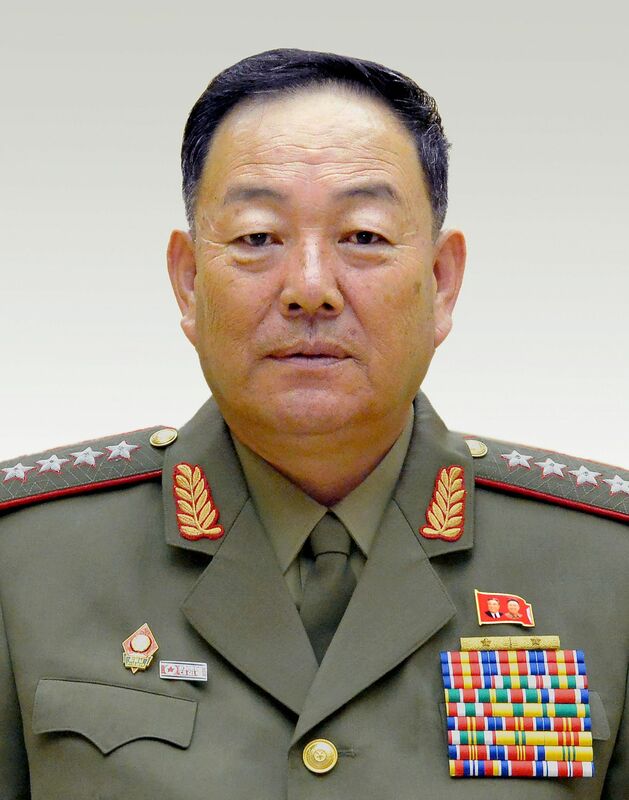 The promotion confirmed Kim’s role as top leader of the North Korean military and came days after the replacement of Chief of General Staff Ri Yong-ho by Hyon Yong-chol. During a 26 July 2012 performance marking the 59th anniversary of the armistice of the Korean War, security around Kim reportedly increased dramatically because Kim “is extremely nervous about the possibility of an emergency developing inside North Korea” caused by “mounting opposition to his efforts to rein in the military”. In November 2012, satellite photos revealed a half-kilometer-long propaganda message carved into a hillside in Ryanggang Province, reading, “Long Live General Kim Jong-un, the Shining Sun!”. The message, located next to an artificial lake built in 2007 to serve a hydroelectric station, is made of Korean syllable blocks measuring 15 by 20 meters, and is located approximately 9 kilometers south of Hyesan near the border with China. Officially, Kim Jong-un is part of a triumvirate heading the executive branch of the North Korean government along with Premier Pak Pong-ju and parliament chairman Kim Yong-nam (no relation). Each nominally holds powers equivalent to a third of a president’s powers in most other presidential systems. Kim Jong-un commands the armed forces, Pak Pong-ju heads the government, and Kim Yong-nam handles foreign relations. Nevertheless, it is generally understood that Kim Jong-un, like his father and grandfather before him, exercises absolute control over the government and the country. On 30 November 2012, Kim met with Li Jianguo, who “briefed Kim on the 18th National Congress of the Communist Party of China“, according to the KCNA news agency. A letter from Xi Jinping was hand-delivered during the discussion. In 2013, Kim re-established his grandfather’s style when he made his first New Year’s address, a break from the approach of his father. Kim Jong-il never made televised addresses during his 17 years in power. 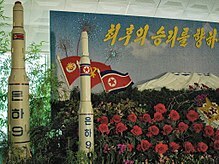 In lieu of delivering a speech, Kim Jong-il contributed to and approved a New Year’s Day editorial, jointly published by Rodong Sinmun (the daily newspaper of the Korean Workers’ Party), Joson Inmingun (the newspaper of the Korean People’s Army), and Chongnyon Jonwi (the newspaper of the Kim Il-sung Socialist Youth League). At the extraordinary meeting with his top defense and security officials on 26 January 2013, Kim issued orders on preparations for a new nuclear test and introduced martial law in North Korea effective from 29 January. In May 2014, following the collapse of an apartment building in Pyongyang, Kim Jong-un was said to be very upset at the loss of life that resulted. A statement issued by the country’s official news agency the Korean Central News Agency used the rare expression “profound consolation and apology”. An unnamed government official was quoted by the BBC as saying Kim Jong-un had “sat up all night, feeling painful”. While the height of the building and the number of casualties was not released, media reports described it is a 23-story building and indicated hundreds of people may have died in the collapse. On 9 March 2014, Kim Jong-un was elected to the Supreme People’s Assembly. He was unopposed, but voters had the choice of voting yes or no. There was a record turnout of voters, and according to government officials, all voted yes. The Supreme People’s Assembly subsequently elected him chairman of the National Defense Commission. In August 2012, Kim Jong-un announced economics reforms similar to China. Kim began to be mentioned by the North Korean state media as “supreme leader” (chego ryongdoja) at this time. A set of comprehensive economic measures, the “Socialist Corporate Responsible Management System”, were introduced in 2013. The measures increase the autonomy of enterprises by granting them “certain rights to engage in business activities autonomously and elevate the will to labor through appropriately implementing the socialist distribution system”. Another priority of economic policies that year was agriculture, where the pojon (vegetable garden) responsibility system was implemented. The system reportedly achieved a major increase in output in some collective farms. North Korean media were describing the economy as a “flexible collectivist system” where enterprises were applying “active and evolutionary actions” to achieve economic development. These reports reflect Kim’s general economic policy of reforming management, increasing the autonomy and incentives for economic actors. This set of reforms known as the “May 30th measures” reaffirms both socialist ownership and “objective economic laws in guidance and management” to improve living standards. Other objectives of the measures are to increase the availability of domestically manufactured goods on markets, introduction of defence innovations into the civilian sector and boost international trade. On 7 March 2013, North Korea threatened the United States with a “pre-emptive nuclear attack”, and Kim Jong-un issued a detailed threat to “wipe out” Baengnyeong Island, the scene of previous naval clashes. North Korea has revealed its plans for conducting nuclear strikes on U.S. cities, including Los Angeles, and Washington, D.C.
At a plenary meeting of the WPK Central Committee held on 31 March 2013 in the wake of war threats with South Korea, Kim Jong-un announced that North Korea will adopt “a new strategic line on carrying out economic construction and building nuclear armed forces simultaneously”. Ri Yong-ho, Kim Yong-chun, U Tong-chuk and Kim Jong-gak were handpicked to groom the young leader and were close confidants of Kim Jong-il. They have either been demoted or disappeared. One South Korean government official said Kim Jong-un is trying to “erase all traces of his father’s rule” eleven months after stepping into power and “replacing top brass with officers who are loyal to him alone”. By the end of 2013, three defense ministers and four chiefs of the army’s general staff had been replaced and five of the seven men who had escorted his father’s hearse two years earlier had been purged, with his uncle Jang Sung-taek one of the most prominent. Jang Sung-taek is believed to have been executed by machine gun. In July 2012, Kim Jong-un showed a change in cultural policy from his father by attending a Moranbong concert. The concert contained several elements of pop culture from the West, particularly the United States. 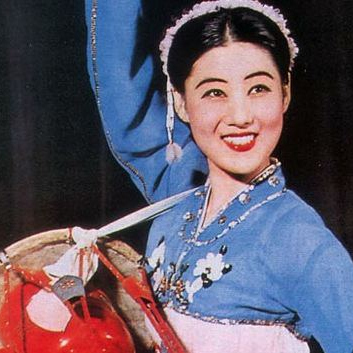 Kim used this event to debut his wife to the public, an unprecedented move in North Korea. 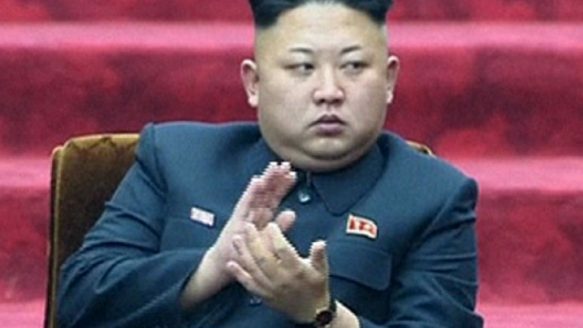 Kim Jong-un did not appear in public for six weeks in September and October 2014. State media reported that he was suffering from an “uncomfortable physical condition”. Previously he had been seen limping. When he reappeared he was using a walking stick. Human rights violations under the leadership of Kim Jong-il were condemned by the UN General Assembly. Press reports indicate that they are continuing under Kim Jong-un. It is believed by some that Kim Jong-un was involved in the Cheonan sinking and the bombardment of Yeonpyeong to strengthen his military credentials and facilitate a successful transition of power from his father. The 2013 report on the situation of human rights in North Korea by United Nations Special Rapporteur Marzuki Darusman proposed a United Nations commission of inquiry to document the accountability of Kim Jong-un and other individuals in the North Korean government for alleged crimes against humanity. The report of the commission of inquiry was published in February 2014 and recommends to make him accountable for crimes against humanity at the International Criminal Court. Kim Jong-un has one half-brother, one half-sister and an older full-brother (see below). He also has a younger full-sister, Kim Yo-jong, who was believed to be about 23 in 2012. She sometimes accompanies him. In March 2013, former NBA basketball player Dennis Rodman visited Kim Jong-un in North Korea and on his return reported that Ri had given birth to a daughter named Ju-ae in 2012.